A few weeks ago we had three "throw together" meals in a row! I explained the throw together meal in that meal plan post. Basically it's dinner made with everything we already have (so no grocery trip to supplement a few ingredients). Sometimes they turn out really good and sometimes they're a miss. But since it's using up things on hand no two are ever alike! Here are the details on the three we made in a row. Since these weren't very official blogging recipes I just snapped photos with my phone. 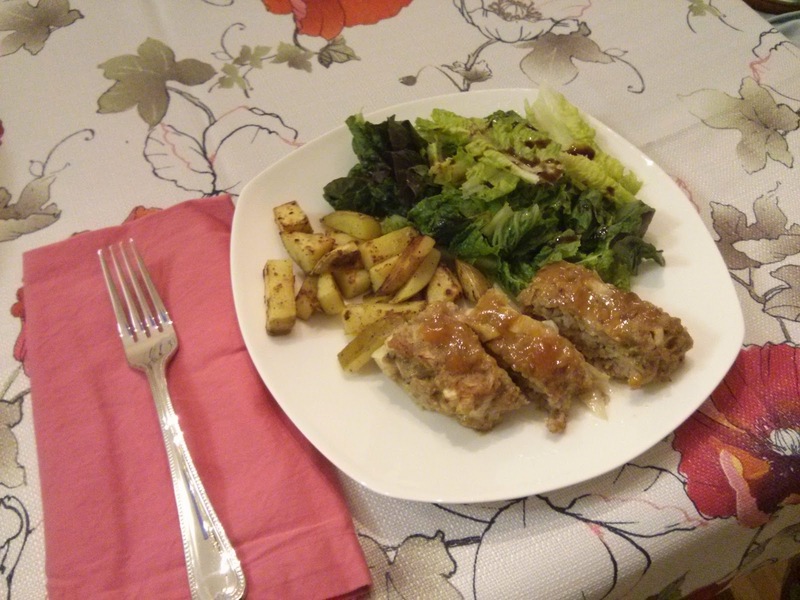 Patrick whipped up the pork loaf (something similar to this) and topped it with a dijon mustard-apricot jam glaze. We had some lettuce that needed to be eaten so that became the salad topped with some balsamic vinaigrette. At first that was going to be all but then I remembered we have some potatoes in the pantry so we roasted a few for crispy potatoes. Typically I buy yukon gold potatoes in the 3 or 5 lb bag since they keep so long and more than likely have a potato at our disposal. I had seen a recipe for chicken with orzo and sun-dried tomatoes and thought we could totally do that. Patrick likes to buy our sun-dried tomatoes from Costco so that means it's a rather large jar that takes us awhile to get through. Usually we have some orzo but when I went to start dinner and grab it from the pantry there was no orzo to be found!! Throw together inspiration now needs to be altered. We had celery and carrots in the fridge so I chopped those up with an onion then added a large can of San Marzo tomatoes to stew down thus making a basic Italian sauce. 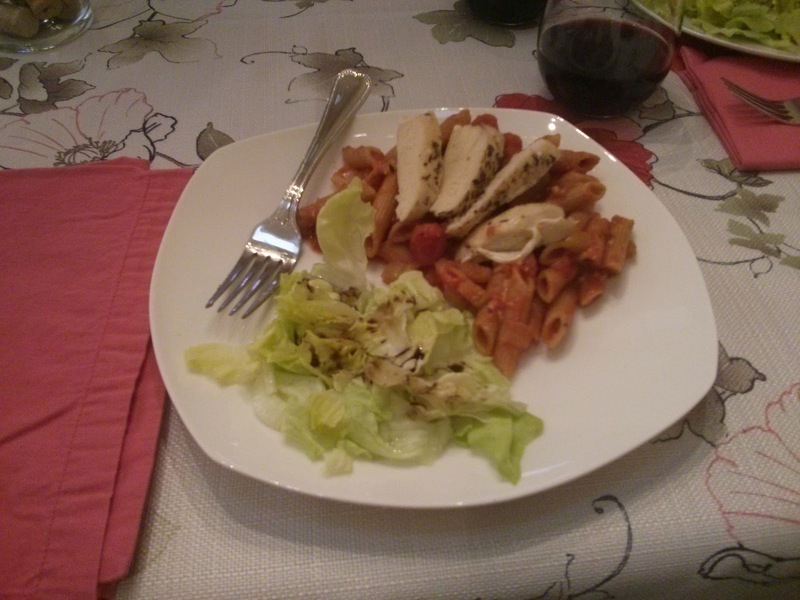 We boiled some penne and baked a chicken breast with some Italian seasonings. We even had another salad from a second head of lettuce that needed to be used up in the fridge! When the third throw together meal night was coming around I wasn't sure we could produce another meal! But then I remembered we had a can of lump crab meat ready for whenever we wanted it. This has been one of our newest additions to our Costco shopping trips. We followed this recipe for the crab cakes we made for one of our anniversary dinners; the recipe calls for you to bake it but we decided to fry it. Unfortunately they fell apart but it didn't take away from their tastiness! 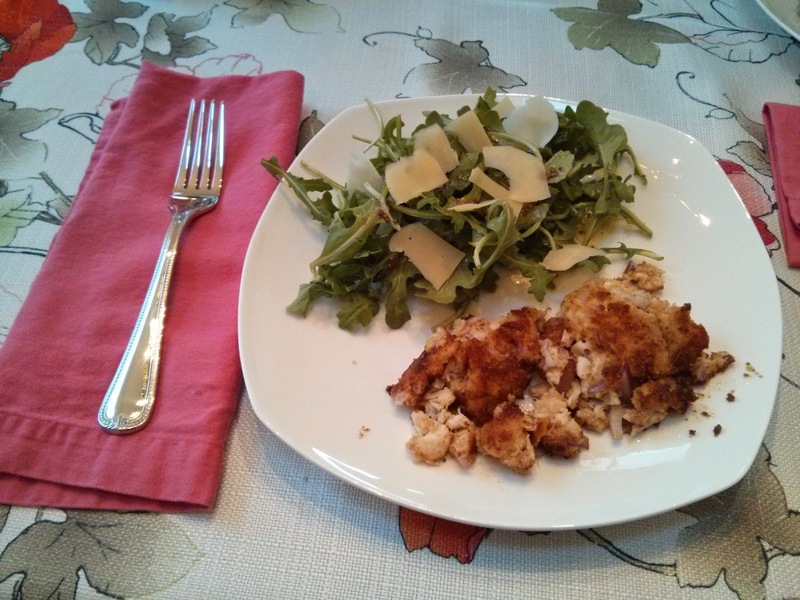 We had some arugula leftover from a meal the previous week and added that to round out the plate. Three very successful throw together meals! I think we were pleased with ourselves since our throw together success rate isn't usally this high especially for three in a row!